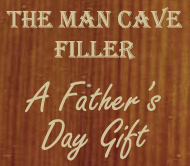 Win $600 Cash + More in the Father’s Day Man Cave Giveaway Event! Looking for the perfect Father’s Day gift? Enter to win $600 Cash Prize to Fill the Man Cave and $100 Gift Card for Restaurant of Choice for Father’s Day Dinner in this Giveaway Event! Enter to win via the Rafflecopter entry form below. Don’t forget to check out our great hosts and sponsors below! This giveaway ends June 7, 2012 at 11:59 pm EST. Open to worldwide, 18 years of age and older. Good luck! « Win in the iPad May-nia Giveaway Event! Oh no! Are you on facebook or twitter? REALLY praying that I could be blessed with 600$ for father’s day. My fiance works 2 full-time jobs just to support our children and I. They only get to see him on weekends. I just want to show my appreciation!